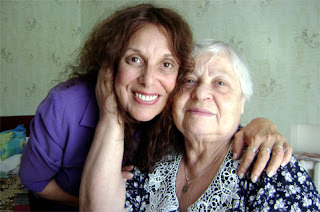 The Survivor Mitzvah Project is dedicated to providing direct financial aid to those elderly and forgotten Jewish Holocaust survivors scattered throughout Eastern Europe who are sick, impoverished, isolated and receive no aid from any other agency. 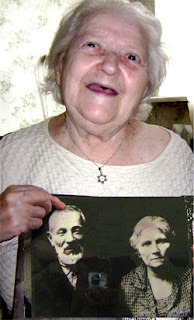 Photo: Esfir with photo of parents who were murdered by the Nazis. The money, which she got from America, prolonged her life – she used it to pay for massage, better medicine, for better food… She couldn’t write letters and send her personal thanks. I will remember her with her hands pressed to where her heart was in eternal gratitude. Age 94 and a decorated war veteran, he is almost totally blind and lives with his wife, also a decorated veteran. 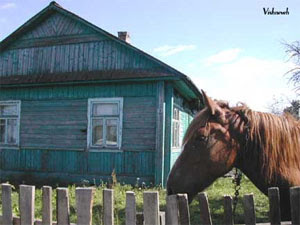 The oldest member of the iny community, he is the only one who was actually born there and not relocated after the war. He remembers life before the war and can show you the streets and building in which the massacres of his people took place. He can describe the once vibrant Jewish community that he knew as a young man. A sole survivor, Chaim's entire family, every single person, from Grandparents to new-born babies, was murdered by the Nazis in 1942, after first being beaten, tortured and starved. Years ago he filled out papers to receive reparations from the German government. He is still awaiting a reply. 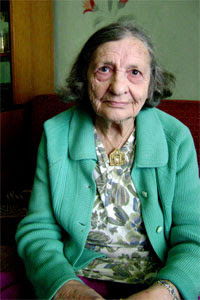 Mera A., 88, is one of only six Jews still residing in the small Lithuanian village of Mariampol and the only one who was raised there. She lives with her severely retarded adult daughter, who receives no social service assistance. Her husband died of liver cancer in 1992. 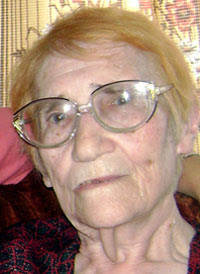 Mera suffers from lung and heart problems and walks unsteadily, rarely venturing outside. Teenage hooligans frequently target Mera and her family in anti-Semitic attacks. They destroyed the front door of her first-floor apartment. Mera desperately needs money for food, heat and medications. "We wait for the winter with horror," she said. When I come to the door I repeat their name [to myself] so as not to mistake it, put the broadest smile on my face, and meet the one who opens the door with the warmest words I can imagine, listen to bits of their news, mostly troubles, diseases, I assure them that everything will be better, that God helps them and always thinks of them. I promise to come back and I smile, smile, smile. Don’t you think that psychologically I get lots of strength and positive energy for myself? After such “trips” I look at the world from a different angle. Actually, I feel much happier. This is what I wanted to thank you for. General impressions are beyond any possible words. The people I visit don’t have enough words to thank you. Some said that now they have an opportunity to live (the situation with the [lack of] medicine and the numerous problems is almost unbearable). There were tears in their eyes. Some kissed my hands. Of course, I tried to convince them that I have nothing to do with all this, I’m simply a transmitter, but at the same time I am happy to be connected to such a Godly deed….I gave almost everybody your addresses and the names of the families [who sent money] but don’t expect letters from all – some are blind, others immovable, still others don’t understand how to do this, etc. I am sending you great thanks from everybody on the list. Some blocks away is Fima, a modest and undemanding woman. She almost never complains, speaks little about her diseases which she has plenty of, I am sure – her legs hurt, blood pressure jumps, not long ago she fell down and hurt her arm and head just inside her traditionally tiny flat. In winter she is afraid to go out and waits for some good soul to bring her food or medicine. And if, as we know, “Hesed” cuts their patronage nurses? CLICK HERE TO HELP FIMA. I even feel how older and weaker this woman has become since 2005 when I saw her for the first time. And one more, Reiza, Yelena’s neighbor and friend. It’s without exaggeration that money from America returned Reiza to life. Her only close relative, her brother, died in 2005 and she didn’t want to live either. 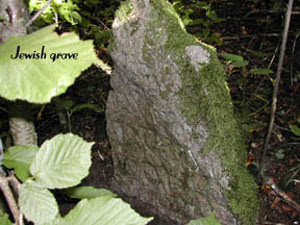 With the given support she put the monument on his grave, used the help of a psychiatrist and other doctors, though of course, it’s easier to gain a disease than to cure it away. Going to visit Rozalia, I am always afraid that I won’t meet her – she spends more time in hospitals than at home; her home is a room in a hostel, kitchen for a dozen other families and a guard at the entrance. Her husband, who was also a disabled, person died last year and again the support from America came in time. CLICK HERE TO HELP ROZALIA.That was the last of my (and yours) recent voyage. I wrote the word “last” and thought to myself, "Hope it won’t be last"… Even being just an intermediary, I feel how important it is to learn “it’s more blessed to give…” I’d love to pass you all, whom neither I, nor my Belarusian friends know, their greatest words of gratitude. You do the right thing – you save somebody’s life. Scattered across Eastern Europe there are thousands of elderly Holocaust Survivors in desperate need of food, medicine, heat and shelter. 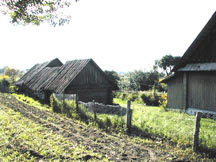 Most are sole survivors of their families who were brutally murdered by the Nazis, some are survivors of the killing fields where hundreds of thousands of men women and children were systematically massacred in every town and village on the path of the German invasion, some fought with the Russians or were Partisans in the forests of Belarus, and some were slaves in the Gulag long after the war ended. All are elderly and in dire need of help. I am a television comedy director by trade, having directed over 200 sitcoms for all of the major networks. During a hiatus between Golden Girls and Blossom, I decided to take a brief journey to Eastern Europe in order to find the birthplaces of my grandparents. In Lithuania, I met the brilliant Professor Dovid Katz of Vilnius University who urged me to stop along my way and visit 8 elderly, isolated Holocaust survivors living in tiny towns and villages in Belarus. He told me to bring food, medicine, reading materials and American dollars. My visit to these people was both life-changing and inspiring. As soon as I crossed the border, it was as if I had gone back in time 100 years. No cars, only horse drawn wagons, little slanted huts, no shops or restaurants, only endless fields, ancient apple orchards left fallow and the ghosts of millions. The only sign of what were once thriving Jewish communities for Centuries were markers for mass graves from Hitler’s SS Einsatzgruppen – mobile killing squads - and desecrated cemeteries - tombstones half buried, dating before the time of Napoleon. And suddenly, a revelation: here and there, the "last of the Mohicans," elderly Holocaust survivors in dire straits, barely struggling to survive. I returned to Hollywood and the world of comedy but I couldn’t get these people out of my mind. What would become of them? How would they last through the harsh winter? Who could they turn to? I was compelled by a force much greater than myself to take action. I contacted everyone I knew, all of my friends and all of the members of my family and started to collect money and send it on to Eastern Europe. Meanwhile, Professor Katz stayed in touch with me and every time he made an expedition to Ukraine, Belarus, Slokavkia, Lithuania to study dialects and languages, he also sought out elderly and forgotten Holocaust survivors and emailed me their names and addresses. My list started to grow. From 8 people it became 35, then 120, and now it has grown to well over 1500 people in 7 countries. With Dovid Katz’s help, and aid from philanthropist Chic Wolk, The Survivor Mitzvah Project was born. 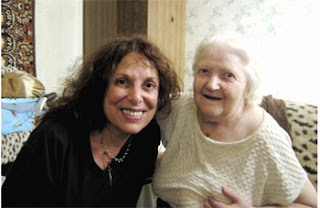 The Survivor Mitzvah Project is dedicated to providing direct financial aid to those elderly and forgotten Jewish Holocaust survivors scattered throughout Eastern Europe who are sick, impoverished, isolated and receive no aid from any other agency. 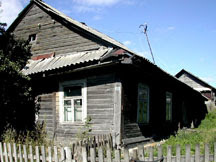 Their families and communities destroyed by the Nazis, they struggle to survive in their few remaining years, lacking the means to buy even the most basic of human necessities: food, medicine, heat and shelter. Most live alone in horrific conditions. Our project, by bringing help quickly and directly to these survivors, helps ensure that they may live out their last years with some measure of comfort, support, and dignity. Your donation goes directly into the hands of an elderly, impoverished, Holocaust Survivor. 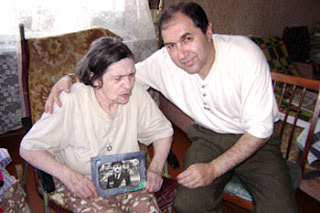 Their friends – a blind old woman Fanya with her unique son Misha. Misha is a middle-aged man who, as he puts it himself, is unmovable; his life is only his job and his mother, who cannot stay alone. Misha dresses and washes her, gives her medicine in time and cooks for her, does shopping and laundry and alongside with this remains cheerful, ironical, amiable and extremely hospitable. Here I also always stay long, and raise a toast with him to his mother’s health. Misha gives his mother expensive pills which he buys for full price not waiting for any preferential prescriptions, he spends all possible money to make his mother’s sufferings less. Why cannot this man hire a nurse to stay with his blind mother while he is away so as not to worry all the time that she will fall or kick herself on the way to the bathroom? Because his salary and her pension are enough only to survive through their everyday difficulties. 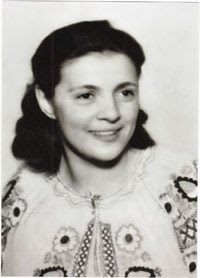 Born in 1924, Meir S. studied at the Yiddish-speaking Shalom Aleichem school in Kovna, Lithuania, graduating just two days before the start of the war. 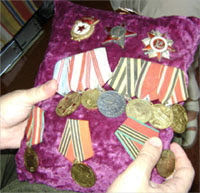 He managed to flee to Russia ahead of the advancing German Army. After the war, Shub earned a doctorate and taught philosophy. In the 1980s, he wrote to people in the West requesting Jewish history books, devouring works by Dubnow, Graetz, Zinberg and others. Then, in 1991, with Soviet tanks ensconced in Vilnius, he bravely began building the Jewish Studies Department at Vilnius University. Later he became a founding faculty member of the Vilnius Yiddish Institute. Now, retired, very ill and almost totally deaf, Shub, 83, needs medications that cost many times what he receives as a pension. His wife, Katya, is also sick. 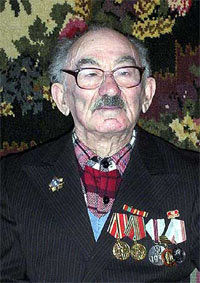 During World War II, Shub fought bravely in the Russian Army's 16th Lithuanian Division, also called the "Jewish Division." He was severely wounded, but he managed to reach Berlin, where in victory he carved on the Reichstag wall, "And here in Berlin am I Meir Shub the Jew from Lithuania." 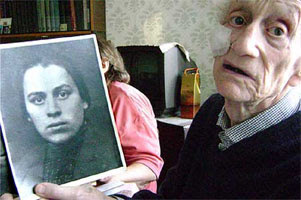 Photo: MEIR HOLDS PHOTO OF HIS MOTHER, MURDERED BY THE NAZIS. 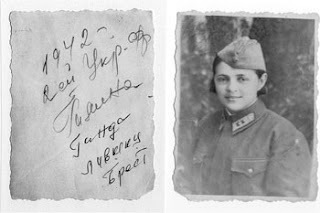 During World War II, Galina served as one of the Russian army's first women aerial gunners and as a bombardier mechanic, working on American planes delivered to Russia during Roosevelt’s Lend Lease policy. Now in her late 80s, she's confined to a wheelchair, her legs mangled and twisted, disabled with multiple ailments, she rarely leaves her apartment because she can't navigate the staircase. 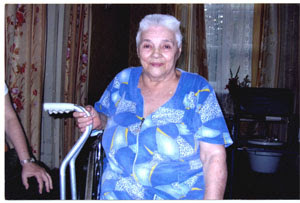 Despite her infirmities, she cared for her bedridden husband who had suffered a stroke -- feeding, washing and repositioning him; changing his linens; and reading to him from Jewish newspapers -- for the last 13 years, with no outside help. She is ill herself, yet she cried to God to stay alive so she could continue tending to him. When The Survivor Mitzvah Project sent her $300 and she was able to buy a washing machine, her life improved; she was no longer exhausted from washing all her husband's clothing and soiled bed sheets by hand. 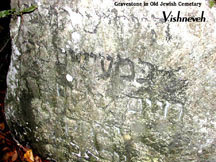 And when he died last August, after languishing in a coma from a second stroke – (a period of time that found Galina praying that she herself would die, because she no longer had the strength to lift him and take care of him) The Survivor Mitzvah Project sent another $600, enough to pay for her medications and his burial and tombstone. 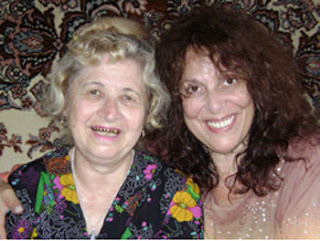 Now Galina has a renewed sense of hope for her future -- for the chance to relax and to read and memorize her beloved poems about Victory Day -- "I didn't think I could survive it, but now I want to live a little," she said. Any donation can help save the life of a holocaust survivor. 100% of our donations go directly to those who need it most.